As fall color drops from treetops to the forest floor in Michigan’s Upper Peninsula, winter makes a swift appearance. Flakes start coming down in late October, and in some regions of the U.P., as it’s known to locals, snow piles up to some 250 inches (the rest of the state averages 26) before season’s end. Not surprisingly, winter in the U.P. is a snow-sport lover’s paradise, drawing not just skiers and snowshoers, but hikers, bikers, and other active types who don’t let a little snow stand in the way of adventure. As they know, the state’s tallest peaks, endless trails, and natural marvels are just as beautiful in the winter. Here are 10 of the Upper Peninsula’s best peaks, and 10 inspiring ideas for how to explore them this winter. 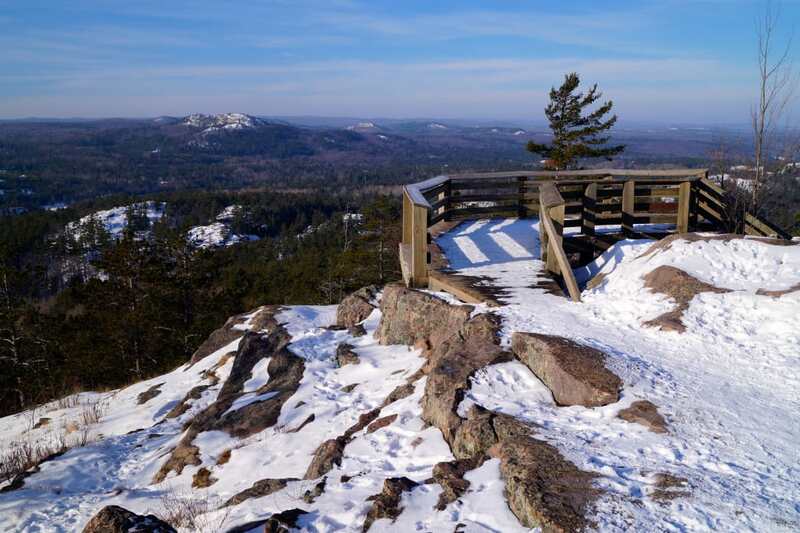 See area landmarks like Presque Isle Park, downtown Marquette, and Lake Superior from a different viewpoint at the top of Sugarloaf Mountain. This must-do hike is only a few miles from downtown Marquette, the largest city in Michigan’s Upper Peninsula, and it takes just 15-30 minutes to climb the half-miler. There’s both an “easy” and “difficult” trail option (the latter slightly steeper), with a series of staircases and boardwalks along the way. Walk under the snow-covered tree canopy and skip over frozen streams, but don’t forget your crampons and heavy layers. 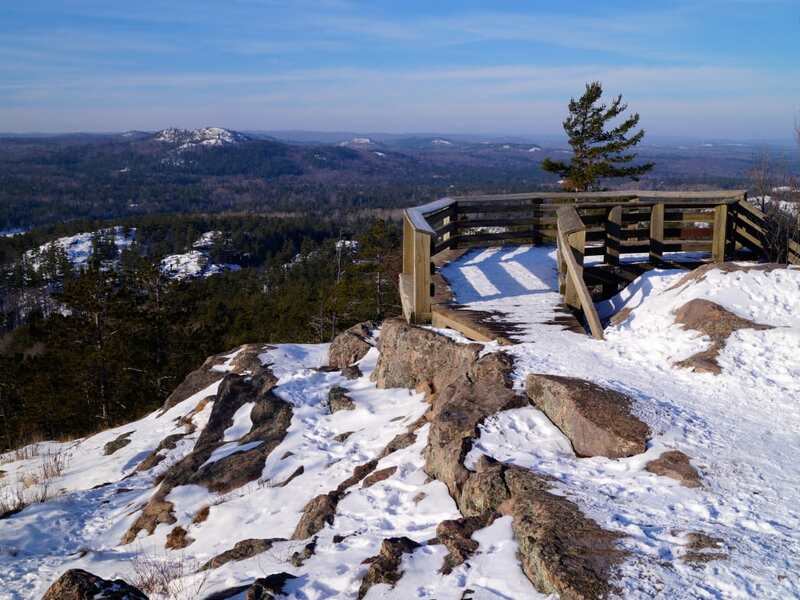 At the top, hikers are rewarded with sweeping, 360-degree views of the Marquette at nearly 500 feet above Lake Superior. After the hike, reward yourself with a pint and hometown music at Blackrocks Brewery. Pictured Rocks National Lakeshore has easily become one of Michigan’s premier outdoor destinations. But in the winter, a different breed of adventurers flock here for an extreme winter sport: ice climbing. With routes from 20 to 210 feet in height, climbers ascend frozen waterfalls along the limestone outcroppings and icy runoff using harnesses, pickaxes, and heavy-duty crampons. Munising also hosts the annual Michigan Ice Fest, which attracts hundreds of ice climbing enthusiasts and beginners for demos, lessons, and winter festivities. The Porcupine Mountains—or the “Porkies”, as locals call them—are a winter sport-lover’s dream come true. The 60,000-acre Porcupine Mountains Wilderness State Park is home to the Porcupine Mountain Ski Area, complete with 15 groomed trails, four glade trails, and more than 350 miles of mixed-use trails. If downhill isn’t your thing, consider cross country skiing or a lantern-lit snowshoe as another great way to explore mountains. Pro tip: Before you leave, make sure to swing by the can’t-miss lookout at Lake of the Clouds, one of the Michigan’s most iconic and scenic spots. Thirty-five miles north of Houghton you’ll find a tucked-away trail, next to The Nature Conservancy along the Eagle Harbor Cut Off Road, that leads to Mount Lookout (also known as Mount Baldy). Ungroomed and powdery in the winter, the trail makes for prime snowshoeing. And because it’s off the beaten path, it offers a quiet and serene wander through leafless pines and towering evergreens. At mile three, you’ll reach the peak, which serves up unobstructed views of the Keweenaw Peninsula and Lake Superior as far as the eye can see. During the fall months, autumn colors pop, creating gorgeous drive-through tunnels of yellow and orange throughout the U.P.—but in the winter, the drive is just as magical. Take the scenic route through untouched forests on Brockway Mountain Drive as you drive north on the Keweenaw Peninsula toward Copper Harbor. At Lake Bailey on M-26 (three miles east of Eagle Harbor), veer right onto Brockway Mountain Drive to begin your trip. Follow snowy curves along the nine-mile road as it carves its way through blanketed, white forests up to Brockway Mountain. At the top, 360-degree views of Mount Baldy, Mount Lookout, and Lake Superior surround you on all sides. It’s truly amazing to see Michigan’s biggest lake, covered in snow, meet the northern horizon on its way to Canada. Located in the snowiest city in the Midwest, Mont Ripley won’t disappoint if you’re craving a back-to-childhood way to enjoy winter at its best. An average of 250 inches of snow blanket 22 trails, a terrain park, a tubing park, and 112 acres of forest on-site at Mont Ripley Ski Area every winter season. Skiers and snowboarders can also hit the slopes, but the tubing park is another major draw. The three-run tube park costs just $17 per person for two hours, or $25 for a day pass. Bikers from all over the world flock to Copper Harbor for its impressive and expansive mountain biking trails during summer months. Come winter, however, the area gets a new wave of bike enthusiasts: the fat tire set. Also called “snow bikes,” fat tire bikes, also known simply as fat bikes, are equipped with large, knobby tires that let riders easily cut and turn through snowy trails with ease. Check the Copper Harbor Trail System guide for the best winter riding—like the Swedetown and Maasto Hiihto trails, which have varying degrees of difficulty. For a no-fuss adventure, rent a bike (or hire a guide) at the Keweenaw Adventure Company. Michigan’s highest peak, Mount Arvon stands 1,979 feet in the north-central region of the Upper Peninsula. While most people hike the 12-mile out and back in warm months, you can also summit Mount Arvon by snowmobile in the winter. Follow the Mount Arvon Snowmobile Trail-14 and keep an eye out for the Baraga County maps and snow report for trail openings. At the peak, don’t forget to sign your name in the “guest book” that’s tucked away inside a blue mailbox. The Tahquamenon Falls draw 600,000 visitors in the warm seasons, and only a fraction of that number in the winter—making it a great time to visit not only for fewer crowds but magnificent, frozen falls. The waterfalls are Michigan’s largest, topping out at 200 feet at the peak of the Upper Falls. Enjoy solitude along the five-mile “Hike Between Da Falls” trail (10.8 miles out and back), or for easier viewing, drive between each location. When you’ve had your fill of viewing the icy mammoths, grab a brew at the Tahquamenon Falls Brewery, located at the Upper Falls. The oldest operating light on Lake Superior shines from The Whitefish Point Lighthouse, standing tall as a historic landmark of the Great Lakes. Visitors can climb to the top of the 80-foot peak of the lookout tower to and peer out over the “Graveyard of Ships” at Whitefish Point. Afterward, browse the Great Lakes Shipwreck Museum to learn about the region’s famed shipwrecks, like the Edmund Fitzgerald, that shaped Great Lakes history. Written by Erica Zazo for RootsRated Media in partnership with RootsRated.